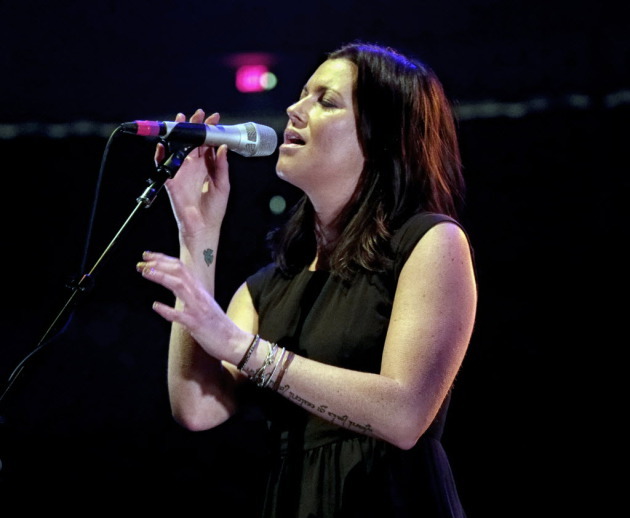 Which Tristan Prettyman was your favorite Tuesday at First Avenue? The one who told the packed throng that they were amazing. Because it was the biggest crowd she’d ever drawn under her own name. Amazing, she told the fans – seven times, I think it was. “You guys made my year,” she said at least twice. Effing amazing, she said in the end. The one who turned introductions to several of her songs into mini-episodes of Dr. Phil. Yes, breaking up with a very famous former fiancé, Jason Mraz, was hard to do. Talking for seven or eight minutes to explain a four-minute song was cathartic. Let’s all take a deep breath. The one who turned four-minute songs into either emotional purges or determined ditties. Songs heard on Cities 97 (which she thanked enthusiastically) that helped create such a demand for tickets that this show was moved from the Fine Line to First Avenue. If her clever, catchy rising hit “The Rebound” takes off (and it should, with its cutesy flirting in Trader Joe’s fruit department and subsequent fruity word play), Prettyman could possibly become a pop star. But she’d have to improve her stage demeanor and stage show. Prettyman is about to turn 31 next month but came across like an immature 23-year-old who’d been burned by a guy for the first time. It’s two or three years later. Let it go. Move on. Accept the pain that led to the creation of some darn good songs (featured on her 2012 stand-out breakup album, "Cedar + Gold"). Don’t dwell on it with fans (Taylor Swift doesn’t need long-winded intros) to make them feel as if part of their ticket price is a co-pay for your therapy session. “Rebound” is where Prettyman is at. But, aside from that tune, her stage patter and song selection missed mostly the optimism she now feels. Eight years into her recording career, Prettyman, who started out as a San Diego coffeehouse singer, hasn’t quite figured how to make the transition to a club packed with 1,500 people. She played acoustic guitar most of the night and was accompanied by one guitarist (Steve Miller) who played either electric, acoustic or bass (on one song, perhaps) and another guitarist (Josh Dunahoo) who played electric, lap, pedal steel and slide as well as electric keyboards. Prettyman also covered Rihanna’s “Stay” (without mentioning the pop star) and John Mayer’s “I Don’t Trust Myself (with Loving You)” (without mentioning him by name but saying it was a cover). Both the messages of the songs and the textures and diversity of their music enhanced the 85-minute set. They also gave Prettyman an opportunity to demonstrate that her slightly raspy voice can be effective on more than emotional but not very tuneful California coffeehouse folk-pop.